I needed something to store and access backups of family photos and important files on my home network. We shoot a lot of family photos and videos, which we like to watch either from a notebook/tablet connected wirelessly, or on our TV through our PlayStation 3. I recently purchased a Synology DS112 network attached storage (NAS) device from B&H Photo for about $200 in February 2013. The DS112 is a very solid NAS device that performs very well as a media server (DLNA/UPnP), as well as a local network file share--although it is not perfect. The one thing that I was a little thrown off by when I first set up the DS112, is that it requires an internal hard drive and will not function at all without one, unlike other NAS drive bays such as ZyXEL units which store the operating system on internal memory. I was hoping to simply plug in my external 2TB USB 2.0 hard drive and go, but I did have to purchase an internal hard drive in order to get things going, and then I was able to connect my external USB 2.0 drive. I bought a Seagate Barracuda 1 TB 7200RPM SATA 3Gb/s 32 MB Cache 3.5-Inch Internal Drive (ST310005N1A1AS-RK-Retail Kit) refurbished from Amazon for about $50 (so I spent a little more than my planned budget of $200) and installed the DSM operating system and was up and running fairly quickly, although the installation process is probably intended for those with intermediate to advanced computer skills. The DS112 is fairly quiet (the fan only creates minimal noise), and it goes into standby automatically when not in use (which is rare, because it's mostly always in use--more on that later). It has a 1.6GHz CPU, 256MB DDR3 RAM, a Gigabit Ethernet port (1,000 Mbps), and supports USB 3.0 and eSATA, which is nice--although I don't have any devices to use on these interfaces yet. The product design looks pretty decent, although the glossy, molded plastic exterior seems a little cheap. 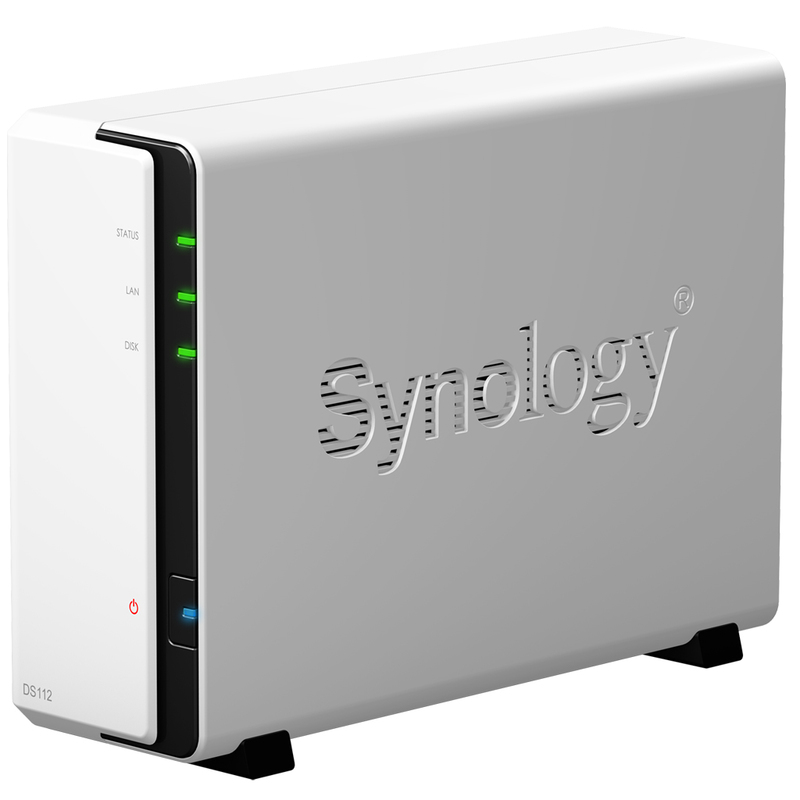 Full specs are available on Synology's site. In terms of specific file transfer performance, I have not yet conducted any formal benchmarking. Synology boasts average read speed at 110.19 MB/s and write speed at 71.84 MB/s. Other reviewers have found similar and slightly lower performance numbers. The DSM operating system that runs on the DS112 (and all Synology NAS devices) is updated regularly, and has many features, 80% of which I don't use (I'm only using the media server and file server). The package manager allows you to install a myriad of apps such as web, database, DNS, VPN, FTP(S)/SFTP, WebDav, mail, printer and directory servers, Python, Perl, Amazon Glacier backup, iTunes Server, Time Machine backup, cloud file sharing services, home surveillance server (using IP cameras), and more. You can interact with a live demo of DSM on Synology's site. The biggest issue I have experienced with the DS112 is how the DSM operating system will automatically index any media (particularly photos) that you copy to it via a network file share. 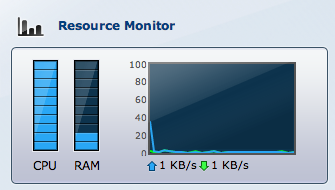 This media indexing TAKES FOREVER, and pegs the CPU at 100% for months. For example, late February 2013, I added an external hard drive containing over 30,000 photos (our family photo archive), and it took over two-and-a-half months to complete. The problem is that every month or so, I upload a new batch of photos to the drive (between 200-400 photos), which usually takes a few weeks to index. Therefore, the DS112 never stops indexing, because it is always catching up on indexing prior months' photos. This particular batch of photos has been creating thumbnails for well over a month. My inquiries to Synology regarding this issue did nothing to solve the issue--apparently there's nothing you can do about it. It is unclear what the purpose of the indexing is. A Synology support rep said, "It is the disk station that is creating the thumbnail and index files, it cannot be turned off...This will continue until it finishes and cannot be stopped. It is not for the media servers it is for the disk station and cannot be stopped." This may not be a problem for those who do not use the device to store photos, or who don't mind the unit running a little hot and longer than usual. Reports from other users on the Synology user forum suggest that all media needs to be re-indexed whenever there is a major update of the DSM system, which is unfortunate. It's not perfect, but for the most part, I have been pretty pleased with the Synology DS112, and I give it 4/5 stars. If Synology would fix the DSM operating system to address this issue, I would have given this unit 5 stars. 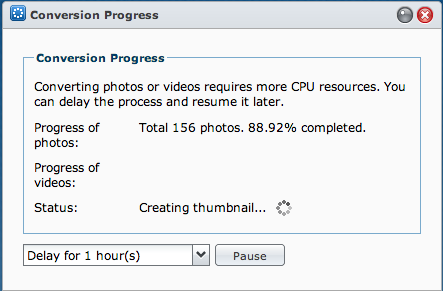 Go to Synology's download page for the DS112 and download Photo Station Uploader and install it on your PC. It uses your PC to generate the thumbnails rather than the DS112, so it's a lot faster (assuming your PC has better processing power/spec's)for large batch photo uploads. Just scroll down until you see it. I don't even have the unit, but I've been researching it, and I found that tip in a user's review on Newegg of the DS112j before coming across yours. Given the number of photos you upload, thought you could really use the tip, so enjoy! I appreciate the comment. Yes, using Photo Station Uploader was the suggestion that Synology tech support gave to me also. The thing is, I use Synkron (http://synkron.sourceforge.net/) to automatically sync all of my photo folders across many different systems (both OS X and Windows). 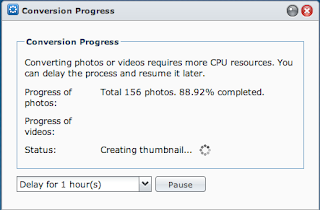 Synology's Photo Station Uploader, is just unnecessary bloat that gets in the way of my otherwise streamlined syncing process. Actually, since the latest DSM update, this problem seems to have drastically improved. Where it used to run for months without stopping, I've found that it usually completes in a few days, now. Still, it would really be nice if Synology could solve this for good, and give users an option to completely disable thumbnail generation for those who do not want or need it. Either way, I'm still stoked about my DS112 and I love it.